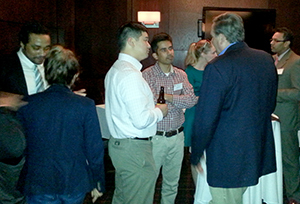 On May 3, ISR held its third local ISR alumni networking reception, in McLean, Va. ISR alumnus Raj Mittu (MSSE 1996) and his company ESCgov graciously hosted the event. These productive alumni gatherings give ISR alumni, industry colleagues, faculty and students a convivial atmosphere in which to network with each other. They are held in a different location each time in the Md.-Va.-D.C. region. In the fall, the next reception will be held along the Washington-Baltimore corridor, most likely on campus, to give alumni the chance to see the changes since they were students here.